Man City v Liverpool Money Back Offer at Betway - Free Bet if You Lose! Money back special at Betway! Are you placing a bet on Manchester City v Liverpool? You can have a bet on this match with no risks attached! Betway are refunding all losing bets (up to $/€/£10) on all betting markets! Amazing offer! 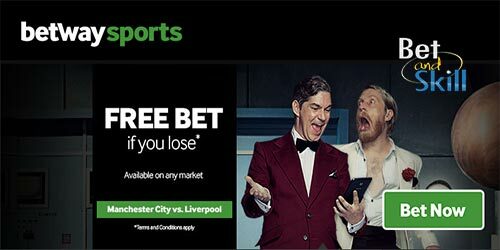 Place a pre-match bet on the match between Manchester City and Liverpool, and if it loses, Betway will refund you with a Free Bet matched to your stake up to £/$/€10. * Refund will be credited in the form of a Free Bet token. Open a new Betway account right now. Take advantage of all their promotions! Minimum stake: £/$/€2 (or equivalent). Maximum refund: £/$/€10 (or equivalent). Applies to single pre-match bets on the Manchester City vs. Liverpool match taking place on the 9th of September, 2017, only. One Free Bet per customer. First eligible bet placed matched. Any bets that result in a void or push result, as well as those cashed out partially or in full will not be eligible. Cannot be used in conjunction with any other promotional offers on this event. Real money bets only – bets placed using Free Bets or Bonus will not qualify. Refund credited in the form of a Free Bet token. Free Bet will be credited within 24 hours of the match finishing. Promotion expires on the 9th of September, 2017. "Man City v Liverpool Money Back Offer at Betway - Free Bet if You Lose!"